This is perfect for a rainy day…better yet, any day!!! So mine started going quite brown in first ten minutes – is it 250 degrees Celsius? And I didn’t understand the booking time, so I’m watching them like a hawk – is it half an hour, an hour, an hour and a half or two hours? I’m presuming it’s until they’re hard, hopefully this batch goes well but any further clues, greatfully received. How much would you recommend making for an entire class of 18 children? Maybe two batches? I honestly don’t remember how much dough it makes since this post was written so long ago. I believe what is shown is one batch. 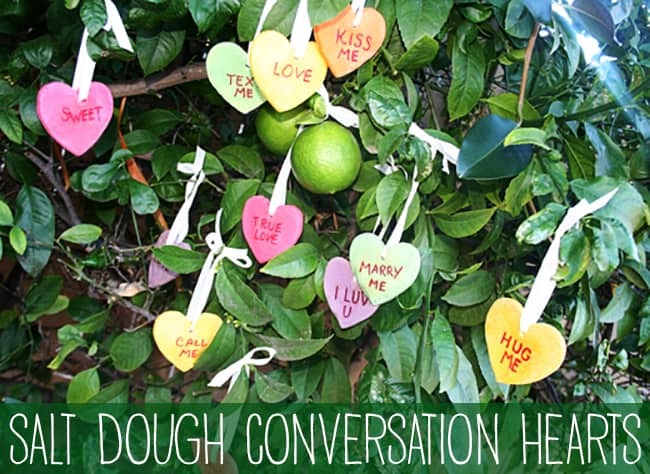 Can you make dough a night before? If so how would i store it? HI. I just did these tonight. The baking I didn’t realize was 2 hours. Making 24 for Valentine exchange for my son’s class tomorrow. I used more flour when kneading. I used McCormick food coloring. 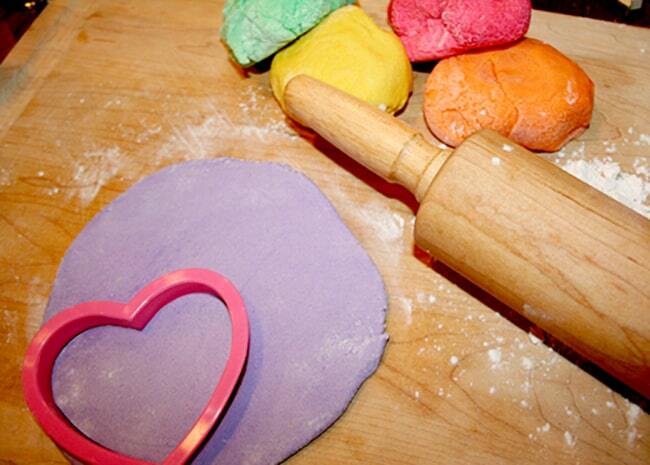 I had no problems except I didn’t expect the constant kneading with flour and working in the food coloring. My son helped out so its kid friendly. My first time doing these. 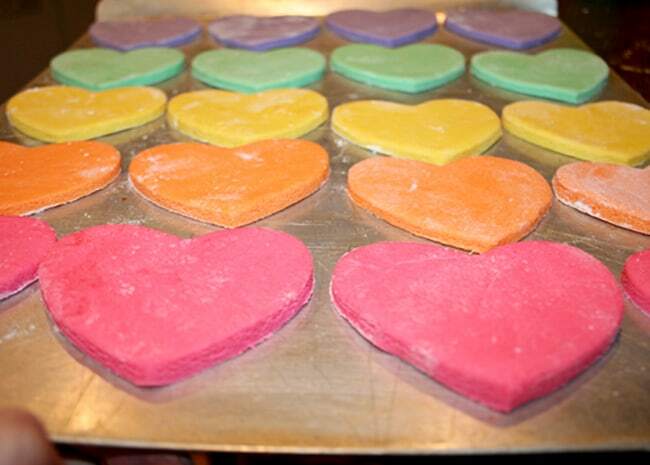 Hoping they all come out good..in time for the morning so my son takes them to school for his Valentine exchanges. We can’t bring candy or food so I thought this project would be a nice treat. I love these conversation hearts! Absolutely adorable! Your blog is brilliant for activities! My 2 1/2 year old & I are currently waiting for these to bake. Even if they don’t come out as nicely as yours, my little one still had a lot of fun. 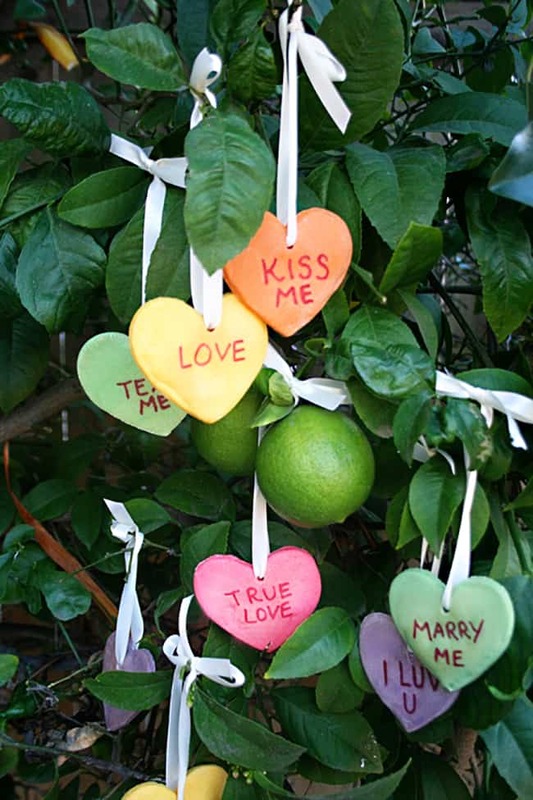 We’ve left up a Christmas tree this year to decorate for Valentine’s Day & these will be perfect. Just hoping I don’t get distracted & let them burn:) Thank you! Has anyone made them at high altitude? I’m wondering about recipe variations.